Most of us think that if we give thanks once (or even just once in a while), we are done. But Paul reminds us that giving thanks should be part of everyday life--more than one day each year. Having said that, I've found that Thanksgiving is a helpful reminder for me to practice giving thanks. It's a time for me to put off my disdain of Peanuts. It's a time for our family to practice saying what we're thankful for before our family dinner. It's a time to re-up my commitment to giving thanks during daily devotions. You see, gratitude is the part of prayer that protects us against discontent. Whether we are prospering or in the midst of deep affliction, thanksgiving grounds us in the goodness of God. And the fruit of gratitude according to Paul is not conflict but peace. What are you thankful for? Leave a note below to let us know. As a child, I loved Christmas. I loved it because of the anticipation of what I might receive. Every activity surrounding the holiday pointed me to what was to come. The decorations, Christmas lights, stockings, tinsel, and smells of cookies all helped to remind and direct my thoughts to the gifts I would receive. I can still strongly remember and feel many of those same emotions. However, now during this season I am more focused on Christ than receiving gifts. This is one of the reasons I am grateful that Advent follows Thanksgiving. Thanksgiving is like an appetizer for Advent. At Thanksgiving, we spend time actively reflecting on what Jesus has done for us in the past year. Advent is a time to celebrate the coming of Jesus. Thankfulness is the perfect soil for expectancy. Jesus is the greatest gift. He is the Wonderful Counselor, Prince of Peace, Everlasting Father. Receiving the greatest gift should be linked to the greatest amount of anticipation. We celebrate the gifts Jesus gives us. One extraordinary gift God bestows on us is adoption. God creates a new family of brothers and sisters. Our new identity binds us together and gives us one more reason to rejoice. This new family is not a perfect family, but a broken one. Yet, even in our sin and failure we find a common bond. It isn't just ideology that unites us. Our brokenness is what leads us to acknowledge our need for Jesus. 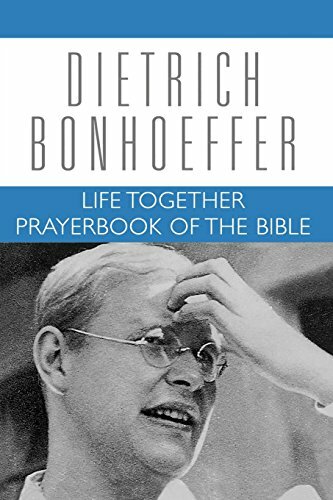 In the book Life Together, Dietrich Bonhoeffer talks about the hope Christians have together, “ The fellowship of the table teaches Christians that here they still eat the perishable bread of the earthly pilgrimage. But if they share this bread with one another, they shall also one day receive the imperishable bread together in the Father’s house. ‘Blessed is he that shall eat bread in the kingdom of God’ (Luke 14.15).” Being in fellowship with one another helps us to see how we can love Jesus more. Our common need leads us to common thankfulness where we acknowledge and celebrate Christ as our common Savior. Through celebrating Advent together we prepare our hearts to worship the True King. As we celebrate traditions new and old we establish memories and practices our families will remember their entire life. The hope is they will pass some of the traditions on to their family. My best hope is that my kids will remember Advent is a time to celebrate Jesus. He is why we gather together, eat great food, and give presents. Every good and perfect gift is from Him. He is our ultimate gift, our great treasure, and One who is worthy of our expectation! When I was a teenager, I got a Christmas present from my parents that was really incredible. It was a luggage set that I would later take on family vacations and mission trips. It was exactly what I needed. And though I got other more interesting and exciting things that year, those suitcases were the biggest, most expensive item. Honestly, I was disappointed and ungrateful. Why? Because I'm greedy. That's one of those Christmas memories that haunts me sometimes now that I'm a parent. I've seen (and fear seeing) the same struggle in my kids. But what can we do about our greed? How do we cultivate contentment in ourselves and our kids in the midst of such a consumer culture? I haven't got this figured out, but here are two simple practices I'm embracing this holiday season. 1. Be honest about your greed. Frankly, greed isn't one of those sins we confess very often. When I sit with my accountability partner, I'm careful to confess how I've struggled with lust or anger. But then I'll find myself saying something like, "Have you seen the new iPhone?" The fact is that I struggle with greed whether or not I admit it. I covet the next guy's influence and position. I see unfinished home improvement projects and I start lusting for that better house or nicer neighborhood. I struggle with greed when I find myself looking at the latest upgrade or browsing through clothes I can't afford. I'm greedy, and my first step in fighting greed is to confess it... to my wife, before my kids, and to my friend who holds me accountable. 2. Practice thanksgiving. Practicing thanksgiving. Here is one practice Megan led our family in during the month of November. Every time we sat down to eat dinner together as a family, we asked our children to say one thing they are thankful for. Then we thanked God for each of those things along with our meal. You may also consider taking a few minutes this week to write thank you notes before you give gifts. Writing thank you notes before Christmas helps cultivate gratitude for the friendship, character, and love you've seen in others and not just the gifts they've given you. 3. Give. If you are not giving to your local church, begin during the holidays. If you already give regularly, you might consider setting aside a regular part of your monthly income over the next year in a benevolence account for missionaries, the poor, and friends who are in need. One way to fight greed is to scheme about ways to practice generosity. In Prepare Him Room, Marty Machowski suggests some practical ways to make regular holiday traditions more outward. He suggests taking your family out to look at Christmas lights, voting on the best neighborhood display, then going back on another night to give that neighbor Christmas cookies. What practices help you fight against greed? How are you scheming to cultivate generosity in your family?